"WACK! 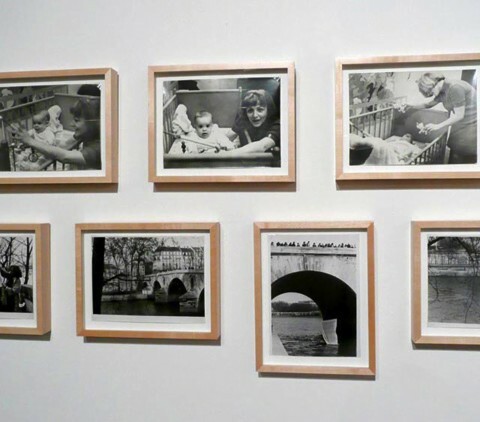 : Art and the Feminist Revolution," is an exhibition at P.S. 1 that takes a historical, international perspective on artists working in the late 1960's and 1970's who were either involved in or impacted by feminist activism. 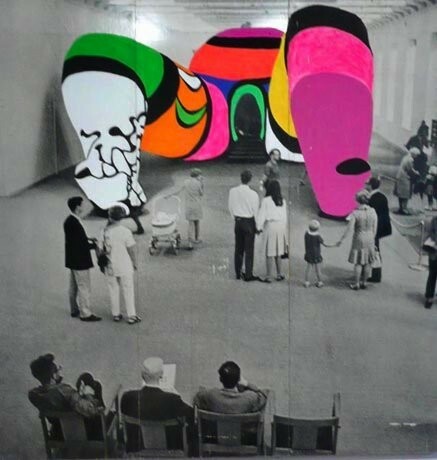 I'm itching to see it [it closes in May], but meanwhile, Artnet has a couple of works by the overly-famous-in-my-book Niki de Saint Phalle and the too-little-known-at-all Lea Lublin. Inspired by the pregnancy of her friend Clarice Rivers, the wife of American artist Larry Rivers, she began to use her artwork to consider archetypal female figures in relation to her thinking on the position of women in society. Her artistic expression of the proverbial everywoman were named 'Nanas'. The first of these freely posed forms, made of papier-mâché, yarn, and cloth were exhibited at the Alexander Iolas Gallery in Paris in September of 1965. In 1966, she collaborated with fellow artist Jean Tinguely and Per Olof Ultvedt on a large scale sculpture installation, "hon-en katedral" ("she-a cathedral") . for Moderna Museet, Stockholm, Sweden. The outer form of "hon" is a giant, reclining 'Nana', whose internal environment is entered from between her legs. The piece elicited immense public reaction in magazines and newspapers throughout the world. The interactive quality of the "hon" combined with a continued fascination with fantastic types of architecture intensifies her resolve to see her own architectural dreams realized. If that stroller is too distracting for you, here's a vintage snapshot of crowds lined up to enter Hon, and here's a photo of the sculpture in progress, from an angle designed to miss the point of the piece. Overly famous, huh? I chuckled at that one because Niki de Saint-Phalle spent the last part of her life in my home town of La Jolla (San Diego), and her sculptures and other art are everywhere here. De Saint-Phalle may be a tad overexposed in certain circles (like Botero), but her work is really great for kids. The Chicago Botanic Gardens hosted a big summer show of her outdoor sculptures and our daughter loved climbing all over them and trying to figure out what hybrid creature she was entering into or emerging from within. It reminded me how much I want her to experience Parque Guell by Gaudi in Barcelona sometime. And while those in La Jolla might be a bit bored by the Niki-mania (I was there two years ago and it was a little fatiguing), I wouldn't mind having a few of them permanently installed in Chicago parks for the kids. I was there in 1966, the little girl in the front could have been me. I remember climbing inside, you could sit under the dome shaped belly and even climb down the legs to reach a room in the foot. I vaguely remember there was something with sound as well. Needless to say the sculpture left a lasting impression on me! I wished I could own a Nana!